I love cooking, but like many parents, on weekdays I need dinners to come together fast (often one handed while I haul around Violet, whose latest great delight is honking my nose repeatedly). We've been in a bit of a food rut, so when my friend Kristin Appenbrink at Real Simple asked if I would participate in a blog relay about their stress-free month of dinners, I was like, um yes, I need ideas for a stress-free month of dinners! 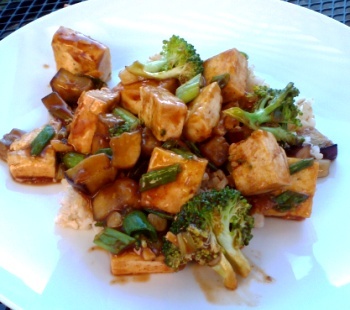 I chose to relay around the eggplant and tofu stir fry since Laurel is a vegetarian. I made this dish on Sunday, after having nine girls crash around our house for Laurel's birthday. I was tired from Violet's early wake up and given that I've been sleeping very little the last couple of weeks as I've worked on the final pre-galley edits for Minimalist Parenting (which we submitted yesterday -- yay!). And Violet kept wanting me to pick her up (honk, honk). All of this is to say that I didn't have a ton of gas in the tank; I was putting the ease of this recipe to the test! I cooked brown instead of white rice. I subbed half the eggplant for broccoli to add greens and since Jon and Laurel are not wild about eggplant. I skipped the chili (since Laurel is not into heat) as well as the basil (because I forgot to put it on my shopping list). Jon and I found the dish satisfying and I loved that it was a one-dish meal. Laurel gave her thumbs up (except for the eggplant) though when given the choice, she wanted macaroni and cheese for her main meal. Curiously, Violet (who inhales things like grape leaves and hummus) wasn't into the hoisin sauce and instead wolfed down an impressive amount of plain tofu. Cut the rice vinegar down one tablespoon'ish; it could be a function of the interaction between the rice vinegar and particular brand of hoisin sauce I bought, but there was a little too much sour to the dish. Pursuant to bullet one, I'd also add one teaspoon of sugar to contrast the sour. Since Jon and Laurel both are not eggplant fans I would swap in something like mushrooms, or perhaps just make it entirely broccoli and tofu. This recipe would also do well swapping in chicken for the tofu so I will probably try that in the future if I'm just cooking for me and Jon. Fun. Yum. I'm looking forward to trying some more wicked fast dinners. One note for the vegetarians out there is that only 4 of the 20 meals of the stress-free month of dinners are vegetarian. However, you could swap the meat out or check out these 41 vegetarian recipes (I'm all over those after I publish this post...). Enjoy! And to find out who's next in the blogger relay series, check out the Simply Stated month of dinners tag.